Tips on how to preserve Mandevilla through the winter months. Mandevilla (Dipladena) are tropical vines, hardy (depending on cultivars) in zones 9-11. They tolerate a minimum temperature of 45-50 F at which time growth will begin to slow down. For winter storage keep the plant outside as long as possible before bringing it indoors. Check the plants for insects and use insecticidal soap if needed. Mandevilla can be treated as a houseplant. It may be trimmed back to make it manageable indoors and needs a sunny, bright window to flourish through the winter. Water once a week, keeping it on the dry side. You will get some yellowing and leaf drop due to lower light and humidity indoors. Don’t fertilize in the winter. In spring increase watering and start to fertilize. Another way to winterize mandevilla is in a dormant stage in a garage or cool basement with temperatures around 45-55F. Cut it back to about 12 inches above the soil line. Treat for insects if needed. Keep it dry but not completely dry. Check periodically for soil moisture. Mandevilla will eventually drop all its leaves. The important thing to keep in mind is that you want to keep it alive it through the winter. In early spring, prune back any spindly winter growth and if pot bound repot in fresh soil. When new shoots begin to grow, start to lightly fertilize and move the plant to a sunny window. Pinch the new growth to get a bushier plant. Set outside when danger of frost has passed or night temperatures are above 55. Hi I have a plant in a fairly large pot (24 inch) that is three years old now. It has grown up to be about 9 foot tall but is starting to look very leggy with few flowers and leaves on the bottom 7 feet or so. I water and fertilize it regularly and it was looking good until recently. Should I cut it back or increase the fertilizer to get more growth on the bottom? Both. It won’t hurt to trim back your madevilla. You trim up to 1/3 of the plant. It will promote lateral growth. Also feed it to stimulate new growth. Make sure it gets enough sun. I live in Minnesota and love the plant. How do I re-pot it? Major repotting and dividing should be done in late winter/ early spring. At this time, you can cut back the roots and leggy growth (if needed) before it starts to grow again. Gently knock out the whole root ball, “tickle” the roots and replace it in a slightly larger pot (1-2″). If the root ball is pot bound with tightly circling roots, then pull apart and trim some of the roots. Do dipladenia prefer to be rootbound? I put in larger pot when I brought indoors. Just curious. If your plant is root bound and does need a bigger pot, look for one that is wider, but not much deeper. They bloom best when roots hit the bottom of the pot but still have room to grow. I have never done this but I would repot the bulbs and see what happens. Silly me but I didn’t take this plant in last winter in Detroit, MI. I cut one stem to the ground and left one stem on the trellis. I mulched them with day lilies and hosta leaves over the winter. Both vines came back bushier over this past summer. Wow!! that’s great. Must have been a mild winter. I wouldn’t count on that happening again. I overwintered my mandevilla in our sunroom, where the temp was about 55 all winter with good indirect light. In April I cut them back (tons of spindly vines) and fed them. Put them outside Memorial Day. Despite regular feeding, they have grown bushy, lush foliage, but no blossoms. Any advice? Sometimes they take their time to bloom. Mandevilla like warm temperatures and lots of sun. If you feed it, give a a bloom boost fertilizer than is low in nitrogen (eg. 10-30-20). If all else fails, try epsom salt to stimulate blooming. see previous question. Am in zone 8a, just bought one of these beautiful plants and was hoping to train it to grow along my fence. Now from all I have read, it seems I should rethink and just have it grow on a trellis. Do you think it would work on a fence? Secondly, I was hoping to plant in ground as I have the perfect soil for this plant, but I am worried about killing it when I have to dig it up for winter. about how far around the base will root system grow, or more precisely how far out from the plant should I shovel out from? I live in AZ and last year we planted two mandevillas. During winter we had a freak cold snap that got below freezing. I just dug one up thinking that it was completely dead, but much to my surprise the roots were like long sweet potatoes and looked healthy. So should I just cut the other on down to just below ground level? If I do will it come back? There’s a good chance that your mandevilla’s roots are still alive and may recover. It will depend on how cold and how long the cold snap was. Trim all the dead stems up to green growth. Usually about 1/3 to 1/2 of the plant. If it died down to the ground, then you have no choice but to trim to the ground (not below) and see if the roots will send up new growth. Once he weather warms up, you should see signs of new growth. I love this site. FINALLY found one with great info on mandevilla plant and not just questions. I live in the Cleveland Ohio area. In fall I brought my plant inside. I didn’t know I was to trim it back. Is it too late? Also, leaves are turning yellow and dropping, getting sparse. Should I trim it or is it too late. Any help is appreciated! Mandevilla will drop their leaves in winter due to low light conditions indoors. Best time to trim is in late fall or early spring. I would trim the vine by 1/3 in late winter/early spring to get rid of the spindly growth it develops during that time. It should grow new leaves in the spring when the days are longer and warmer. Some mandevilla get quite large over the Summer, therefore cutting them back in the fall helps keep them manageable. I usually don’t trim mine until Spring. My mandeville are hanging baskets. I bring them into my basement each year to winter. They need to be repotted. How do I handle the roots? Should I trim them back? Leave the baskets in the basement for the winter and transplant in late winter when they begin to wake up and show signs of new growth. When transplanting, remove any dead/dried up roots. You can root prune some of the roots (1/3) but usually, instead of trimming I transplant in a larger pot. I do so I don’t have to dig them up? I don’t have any place to store them over the winter? I live in Memphis TN I think I’m in zone 7. Mandevilla are tropical plants zone 9-11 and will not survive the winter in zone 7. You can dig it up and keep it indoors as a houseplant. Place your mandevillas in the sunniest window and treat them like a houseplant. The other option is to let it go dormant. see article above. Help!!!! I brought in 2 mandevillas in for the winter. I have to admit I’d did forget about them and the soil went dry a couple times. I watered them but didn’t let them sit in the water. It is now the end of February and I see no green on them and they look like I’m growing 2 pots of sticks. where do I go from here. Do I bring them out and put them in the sun? are they dead? It’s too early to put them outside. Mandevillas are tropical plants and need warm temperatures to grow. They need night temperatures in the 50’s before you can leave them outdoors. Place your mandevilla in a sunny window and keep the soil slightly moist. If you don’t see any new growth after 6 weeks then it’s probably dead. Hi & thanks for the great info! Just curious if now would be the time to thin/repot my Mandevilla. It takes up nearly all of the pot it is currently in, and I had thought about separating it into 2 smaller plants. Will this harm the plant? Should I simply repot into a bigger pot and leave the root system be? The best time to repot your mandevilla is in early spring when it’s ready to start growing again but that doesn’t mean you can’t do it now. If your mandevilla is going to spend the winter outside, then you can repot it. If you are going to bring it indoors for the winter, then I would wait until early spring to divide/repot. Hello – I have about 15 pretty pink mandavilla’s around my home. Boy are these beautiful. I need to save for next year. 5 are hanging plants, 6 are potted & on trellis and the rest in the ground. Can I keep these in my basement in my home without any sunlight or will they die. My kitchen/den get all the sun but I do not have the room for all these plants. You can keep them in a dormant stage in a garage or cool basement with temperatures around 45-55F. Cut it back to about 12 inches above the soil line and treat for insects if needed. Mandevilla will eventually drop all its leaves during the dormant stage. Keep it dry but not completely dry. Check for soil moisture one a month and water lightly if the soil is pulling away from the sides of the pot. The important thing is to keep it alive it through the winter. Hello again and thank you for the info- could you be more specific on cutting back to 12″. all my potted and hanging came on an arched trellis. they are all vined at this time and still blooming. second, can i dig up the ones in my yard to save or do i leave them alone. do mandvilla’s need light when winterized in basement. i plan on giving a systemic insecticide and maybe a spray before i bring indoors. Stacie you do not mention your heat zone, if below 9 as noted above, you need to dig them up. Store them where it is cool and follow directions above. You do not need to worry about light, can be dark. Hi, Karen: my mandevilla is probably 5 years old. I also bring it indoors for the winter (Wisconsin). Its leaves turn yellow and drop but it continues to grow and flower. I have it sitting in a sunny room with about 65 degree temps. I don’t water it as much in the winter as I do in the spring and summer. I fertilize in the spring and take it out in the summer. This year with the very hot temps we’ve been having for extended periods it hasn’t been blooming as much as last summer despite me watering it. I have it in a sunny location for most of the day. The only time I prune mine is in the winter because the tendrils get very wild so I snip them off. Final word – persevere; you’re doing fine. Marilyn I also live in Wisconsin and bought a mandevilla this year to replace the one I lost when I lived in SD I think I know where I went wrong there as we had a wood stove and I had most my plants in that room. LOL! My other plants did great but not that one I must of cooked it. I know this is a old post but how much water do you think I should give mine? water once a month thoroughly or a inch once a week I read that some where to, or an inch once a month any help would be appreciated. Thanks. I can’t give you a definite measure. Keep the soil moist but not too wet in the winter. With low light and slow growth, mandevilla will not require much water. Water it well once a week and when the top 2 inches feel dry or the pot is light, water again. Hi, I have a question about my mandevilla. How do I get them to start flowering again after being inside all winter? I have beautiful foliage and lots of vines but no flowers. I live in Michigan and don’t have full sun anywhere on my property. Last year the flowers never stopped. Mandevillas bloom on new growth. They need to put on good healthy growth early in the season in order to initiate blooming. They can be slow to start blooming the second year after wintering over. Sounds like you’re off to a good start. Are you fertilizing the plant? If so, make sure it is getting food with a higher middle # now such as bloom boost to promote flowering. Janet, my limited experience with wintering over various Mandevillas would suggest that some types are simply more vigorous in putting out vines, others vigorous bloomers, and some just slow to go after being dormant for months. We live in San Diego and have people to clean up the garden when necessary. They cut the Mandeville down to the bulb. They are growing outside, in a box against the fence. Will they come back or did they kill them? There’s a good possibility that your mandevilla will regrow from the tubers. It may take a little longer than if there were stems on it. I moved and trimmed my Mandevilla the last of October. I live in Indiana. Trimmed to about twelve inches and put in a garage room which is heated. Should I move it somewhere else. Have little room in garage which is cooler once the temperature drops. Have not watered as yet. Was told about once a month to give it a good drink. Should a little fertilizer be added? As long as temperatures stay above 40F your mandevilla should be fine in the heated garage. It will drop all its leaves and go dormant for the winter. Watering once a month is fine. You want to get the soil slightly moist, just to keep the soil from totally drying out. Soil that is too wet will rot the roots. No fertilizer is needed during the winter months. I am currently moving my Mandevilla plants inside an enclosed porch. How much should I trim from the plants, mine are quite large. I just left them in the pots and moved them inside and have not trimmed any of the foilage off. They are still blooming. In winter I try to keep the temperature on the porch around 40-45. I hope that they make it ok, I live in Cincinnati, Ohio. 40-45F is a little low. They may drop their leaves but the plant roots should survive. You can trim them to make them more manageable while they are inside. Keep in mind you will also trim the vine in late winter in order to get rid of the spindly growth they develop during that time. I am currently winterizing my Mandevilla plant, but I have 2 cats in the house. Is this plant harmful to my pets? University of North Carolina suspects all parts to be poisonous. (www.ces.ncsu.edu) The milky latex can also be a skin irritant. When and how do you prune the Mandeville vine in southern California ? A good rule of thumb is to prune 1/3 of the vine. Prune it in late fall or before early spring. 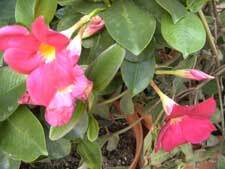 Thank for this great information regarding how to winterize mandevilla! I discovered these beautiful plants late last year after years of bad luck with first holly hocks and then clematis between some long windows in the front of my house. I bought four mandevilla at a special discount to “try out” late in the season from my local greenhouse last year and they were fantastic and so was excited to get them again this year but was not so crazy about the price :(. So when the woman at the greenhouse told me they would survive the winter indoors I was very excited — but have been unsure how to do it and now I’ve found you all! Just one question: HOW MUCH OF THE ROOTS SHOULD I SAVE??? THANKS AGAIN FOR THE GREAT INFO!!! Usually you leave the roots intact in the pot. If not try to save as many roots as you can. Leave a Reply to Eric Click here to cancel reply.